Pregnancy isn't all about that touted glow—this Norwegian artist is pulling back the veil on the less glamorous side effects of expecting a baby. Pregnancy is a beautiful time in a woman's life—but let's face it, some of the side effects are less than pretty. Line Severinsen is, quite literally, illustrating that point. 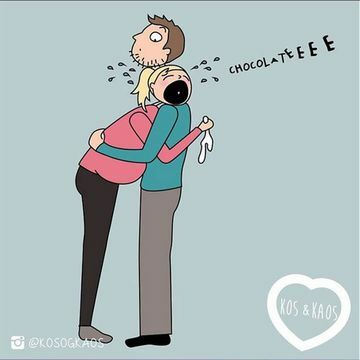 The Bergen, Norway-based mom has garnered a lot of attention for her hilariously real comics of what pregnancy and motherhood look like in their unfiltered moments. The illustrations are witty, well done and attention-grabbing—but more than anything else, they're true to life. They show the parts of pregnancy and motherhood that aren't often discussed: The mood swings, the alcohol cravings, the lingering midsection flab, that frustrating thing that happens when you try to shave below the bump. Severinsen, a mother of two, began illustrating when she was pregnant with her daughter. "I was very sick the first three months," she wrote on her website. "Drawing helped me feel better." She posts her artwork to her website, Facebook and Instagram page, which boasts over 26,000 followers. Some of the funniest posts include an image of someone asking a postpartum woman when she's due, a cartoon of a man sporting a baby bump in solidarity with his pregnant partner and a drawing of a woman with several limbs kicking from within her body. "I started this cartoon as a personal diary in 2012 when I was pregnant for the first time with my daughter," Severinsen told Fit Pregnancy. "I was feeling sick and tired all through my first trimester while all I saw online and in magazines were these picture perfect, happy pregnant super women." There's no doubt that Severinsen's drawings have a similar effect on other pregnant ladies. She told Fit Pregnancy about the overwhelming response her illustrations have recieved, saying: "It's been totally crazy. My inbox, Facebook page and Instagram page are literally on fire. I had to turn off notifications on my phone...I'm super happy that so many people from all over the world are resonating with my art and that they can relate to it." Severinsen promises there will be more cartoons to come, especially since she has two children to look to for inspiration. "I hope that my drawings will show others that you aren't alone," she said. "We all go through some pretty weird stuff when we have babies." That's one more Instagram account to follow, then!